It’s tough….I mean it’s really tough being a Lord of the Rings geek. But what can I do? Somebody has to talk about this stuff so it might as well be me. I was driving to work one morning this passed week and for some reason I started thinking of these stone giants and I realized that our little Hobbit House will probably be able to withstand the force of a stone giants footfall. Soil load plus snowload (125psf and 70 psf respectively) times 1500 square feet equals 292,500 pounds. This would be the equivalent of putting three and a half fully loaded concrete trucks on top of your home. This just so happens to be half the average weight of a stone giant. Stone giants coming in at around 500,000 pounds plus or minus 100,000. As long as a stone giant doesn’t start jumping up and down on our Hobbit house I think we should be fine. Usually they just lumber around changing the landscape as they go. Definitely have to get back to reality now. For those of you not into the Lord of the Rings….. I apologize. So this weekend I got my lumber delivered from Feldman Lumber. They’re out of Brooklyn. The driver told me it took him about an hour and a half to get to the house. So why Feldman you say and not a local lumber yard? The key here is the HDO plywood. 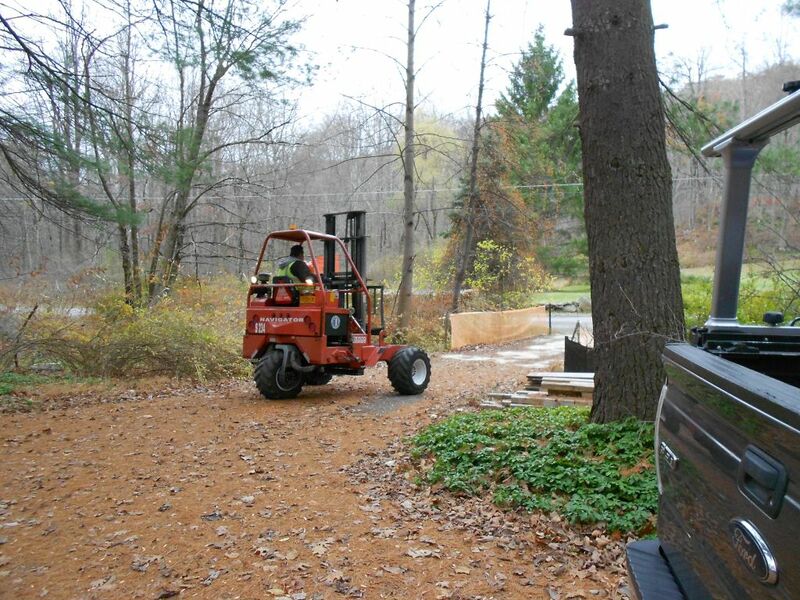 You can’t get HDO plywood from a local lumber yard. In fact they won’t even know what you’re talking about. 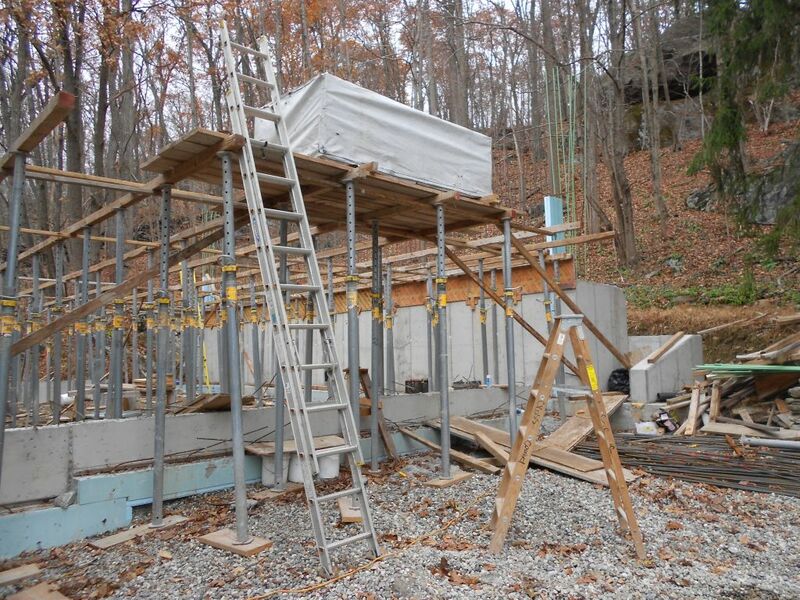 HDO is used exclusively for concrete formwork and Feldman delivers to most of the concrete guys in New York city. So I gave my friendly neighborhood Feldman salesperson Wilda a call and told her we have to make a pitstop up to Pawling , New York. That was easy. I had the truck come with a spider on it. I happen to like spiders on a personal level. I don’t like snakes though. They have always given me the creeps. (Too much information? Okay. Sorry.) It’s not that type of spider though. This is basically a forklift that rides on the tail end of the truck. Once the truck gets to the site they use it to unload the truck and put the stuff where ever you want it. Very convenient. So I sez to the truck driver I sez: Just pull over to the side and drive the spider over the bridge and I’ll show you where to put everything.He says yeah OK let me just turn the truck around…It’ll be easier for me to unload everything. I said your truck is kinda long some of the other drivers turned around up the block and backed down. He says: No. I’m good. This is no problem. I’m thinking :Ok I guess this guy knows what he’s doing. He starts turning around and I go over the bridge to set up for him. The next thing I hear is: Snap! I knew right away what happened but he probably didn’t even notice. He backed into the angle iron I have on the bridge that supports my orange safety netting. It snapped off right at the base. I mean a couple of drivers have bent them a little but I never thought they would snap off. Here’s what one looks like. 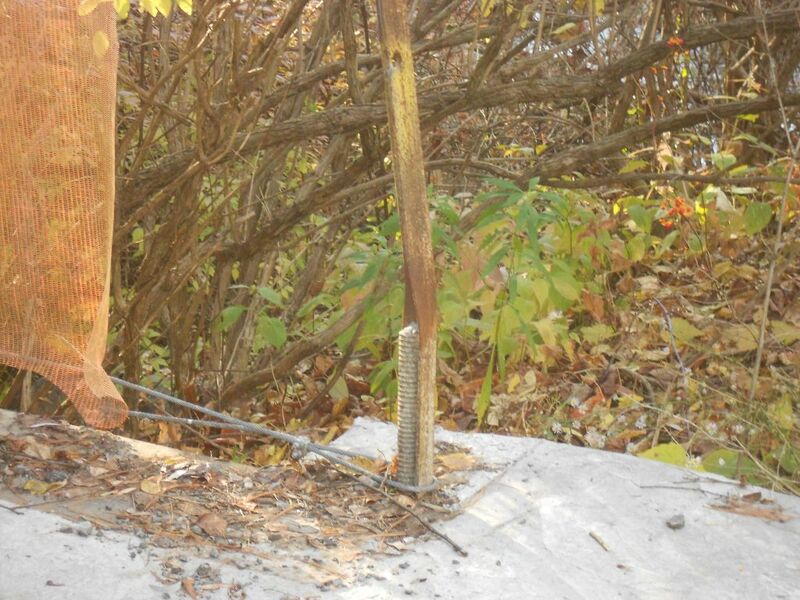 Angle iron at bridge used to support bridge cable for fall protection. You can see this one has been hit. Here’s what the one this guy hit looks like now. Anybody got any great ideas on how to fix this one? 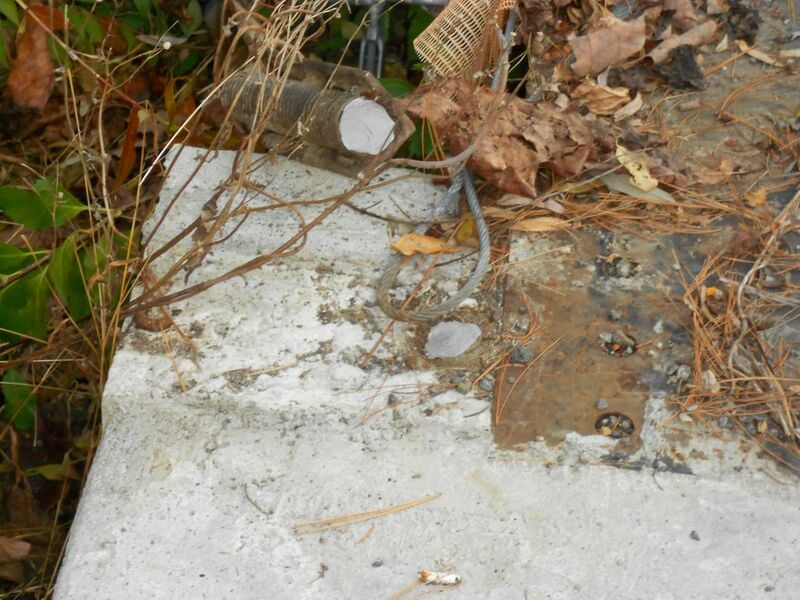 I mean this thing is broken off flush with the concrete. Good job Mr. Truckdriver. I had bigger fish to fry Saturday so I didn’t let it bother me. The truck driver was a really nice guy, too. He was able to put the 1/2 HDO for the roof deck up on the stringers which was great. I actually spent over 2 hours moving stuff and getting everything ready for the delivery. It really only took 10 minutes to unload the truck. I got all the plywood I need for the job and hopefully all the 2×4’s as well. 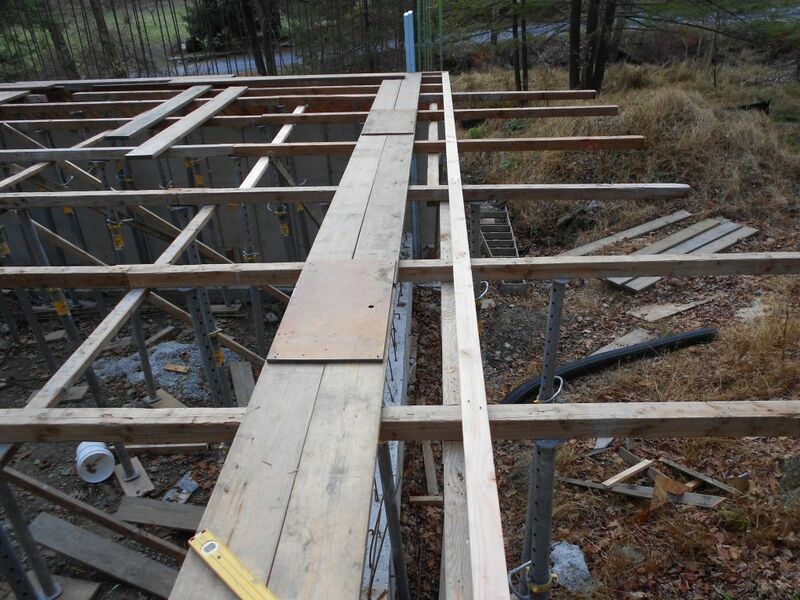 After we pour the roof we’ll be reusing all the lumber and the plywood for the framing and the sheathing of the wood frame portions of the house. There really shouldn’t be too much waste. Any extra plywood I have I’ll save for the next Hobbit house. (Just on a passive house note: I think this HDO plywood is going to be a real score as far as air infiltration is concerned with regards to the exterior sheathing.) Just getting back to unloading the truck check out how I set up for the plywood. Spider places Hdo right where we need it. Just a couple of things to be aware of. Notice the diagonal bracing I added. This is super important because without this a concentrated load like this would make the structure unstable and this load could collapse what we have erected. Later on I told the guys working there that if anything ever happens to these braces we have to fix them right away. This bracing is in the east west direction. Last week I showed you the bracing that is in the North south direction which is on the North side of the job. Remember the cleats that connect the stringers together? Well those cleats help keep the whole system connected together. Therefore you don’t need to add any additional bracing in the north south direction for this specific load. Seems like common sense and it is but it is also something that if it’s overlooked can really turn something fun into a real nightmare. I’ve seen some nightmares and I don’t want to revisit them.Let me just show you a picture of the spider before I move on. Spider used to unload truck. One other item of note. The ladder is extended well above the deck and is also banded securely at the top to the decking. I have to add some additional fall protection next weekend because I forgot to bring some special brackets home from work. So speaking of stone giants and all I was thinking again about the loading when we pour concrete and I got a little nervous. When you get nervous about a concrete pour you should always double back and make sure everything is going to be ok. 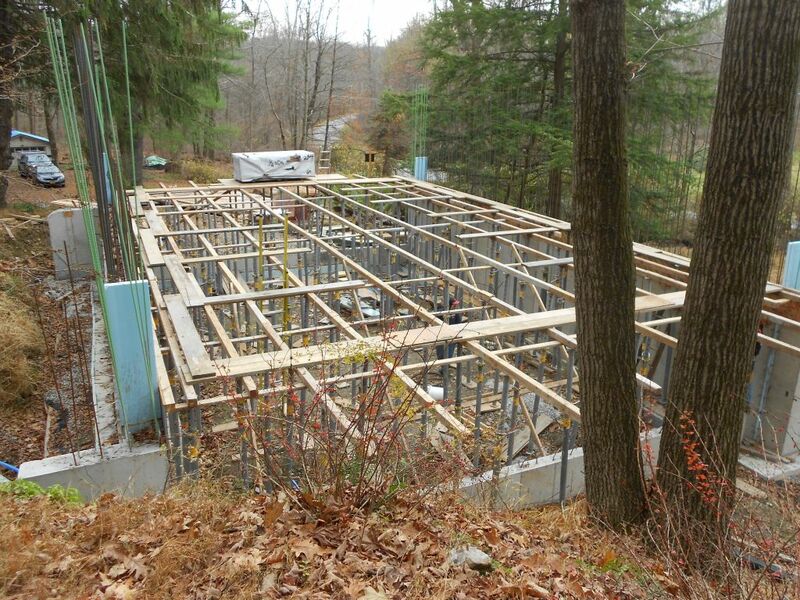 The roof slab starts over the wall as a 16 inch thick slab and tapers to a 9 inch slab at the peak. Translation 16 inches of concrete with stringers at four foot centers means that each post shore is going to carry 3192 pounds of concrete. That’s a lot. The shores can hold that no problem but the stringers and wood structure might not be able to. Let’s put the first few rows of stringers at two foot on center so we can sleep better at night shall we. And so I did. It didn’t really take that long for me to do it. I just had to move one stringer over and add another one. I had Jude and RJ fill in and move the jacks when they got there at 11 AM. Here’s what it looked like. 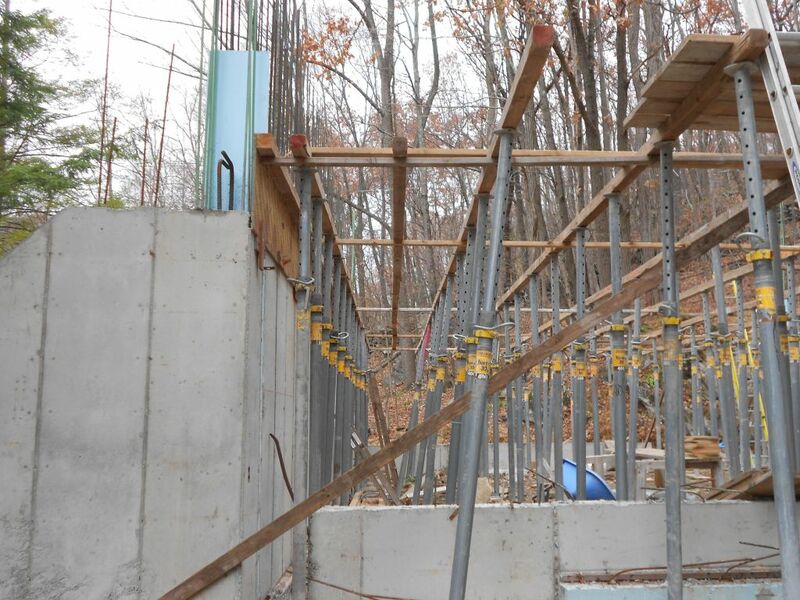 Stringers at wall relocated with stringers now at two foot centers. The main thing I wanted to accomplish this weekend though was setting up for and laying out for the roof structure.It’s all about centerlines. So the templates that we are going to install all have to be perfectly aligned down the centerline of the house. So what I did was put a stringer at this location and snap a red chalkline right on top of it. Check it out. Centerline of the house snapped on the center stringer. The other thing that needed to get laid out is where the templates are going to go. This was a little harder because I needed to set up planking so we can walk around up there. and the planking has to be placed in a way that we don’t put it in our way as well. So I had to lay out spots for the planking, install the planking, and then layout for the templates. It doesn’t sound like much but that is pretty much what we did all day. Some miscellaneous stuff as well but not that important. Here’s how things are starting to shape up. 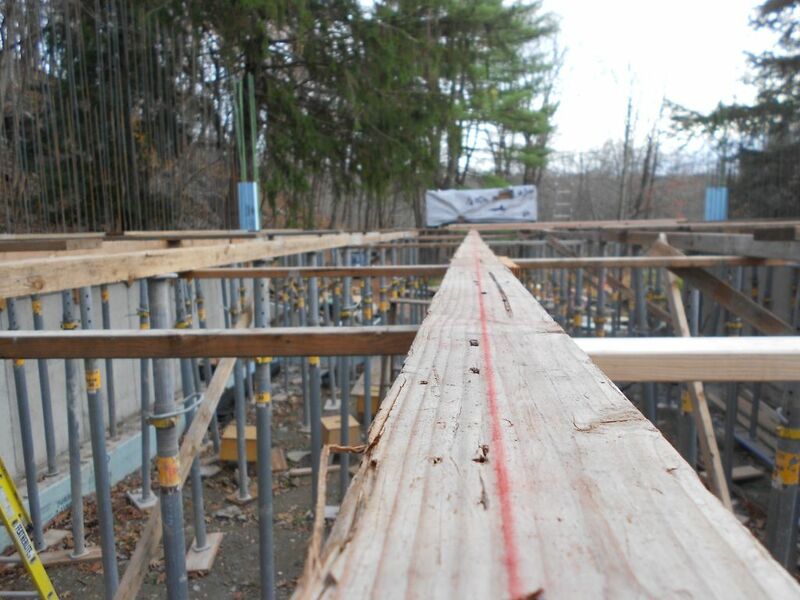 Laying out planking for roof template installation. So once I had this done I had Jude start cutting the kickers for the templates. A kicker is what we call a 2×4 or 1×4 that is used to hold a beam side in position. You nail the kicker down and then you use the meat of that lumber to nail your plywood into. I had to nail at least one kicker down before I left Saturday. It made me feel good. If you don’t get it you’ll understand it a bit better once we start nailing the templates on. (Hopefully next weekend weather permitting.) One down 16 to go. Check it out. First kicker nailed . North side. Jude and I snapped lines for every kicker at the end of the day. Now we’re finally getting it going. Man, I can’t wait for next weekend. Have a good week! Stone giants only move every 150 years or so so don’t hold your breath. Hobbit Roof 102: Hobbit Feet vs. 9th Grade Boys Feet ? Crash! Hi Jim! What a cool blog. I like how you explain what you’re doing so that those of us who can’t hammer a nail can understand. It’s interesting. And the folklore is really geeky, which I like. I also like spiders. Maybe I can buy your house someday? Hi Terry! The blog may be cool but this house will be beyond awesome. Hope all is well, I’ll talk to you soon.